The Department of Homeland Security (DHS) is a cabinet department of the U.S. federal government, created in response to the 9/11 attacks on America. President George W. Bush announced the establishment of the Office of Homeland Security (OHS) in 2001, and Tom Ridge began his duties as OHS director in October that year. In March, 2002, a Presidential Directive motivated the creation of a color-coded terrorism risk advisory scale, and DHS was established in November 2002. Throughout the past decade, DHS accomplished many things, but it appears that many accomplishments that were considered milestones at the time have since been transformed or dropped from agendas. Other milestones, such as the end of the Immigration and Naturalization Service, have succeeded in that the current organization bears no resemblance to its former incarnation. The DHS excels today in processing and disseminating information and in educating and informing the public. At the same time, the current DHS has accomplished goals that often aren’t mentioned. In February this year, one blogger who was involved with the DHS’ Support Anti-terrorism by Fostering Effective Technologies Act of 2002 (SAFETY Act) since its inception in 2001, reported all the goals reached by that one department in 2011. In Fiscal Year (FY) 11, there were 101 approvals, more than 40 percent above FY10 and 20 percent above the previous record reached in FY07. 2002 — In August, the Texas Association of Local Health Officials (TALHO) launched the Texas Health Alert Network (HAN), a statewide system to assist with early warning detection and prevention against infectious disease outbreaks and bioterrorism attacks. Today, a vast majority of the state-based HAN programs have over 90 percent of their population covered under the umbrella of HAN, which is now a national program under the Centers for Disease Control and Prevention (CDC). 2003 — In March, the 69-year-old Immigration and Naturalization Service was dissolved, and its service and enforcement functions were parceled out to three divisions within DHS. Today, immigration services are met by the U.S. Citizenship and Immigration Services (USCIS), with an online service through Immigration Direct. Immigration Direct has empowered thousands of immigrants to successfully prepare their U.S immigration applications. 2004 — In November, the presidential inauguration planned for January 20, 2005, was designated a National Special Security Event (NSSE) by DHS. This designation put the U.S. Secret Service in charge of overall security planning for the swearing-in ceremony, the inaugural parade and the inaugural balls. President Bush’s first inaugural was the first event to be given the NSSE designation. 2005 — The horrific fiasco named Hurricane Katrina occurred, showing the nation that the Department of Homeland Security, under the direction of Michael Chertoff, was basically ineffective during this disaster. Chertoff ignored the storm, saying he relied on FEMA director Michael Brown to make preparations. Brown resigned, blaming state and local officials in Louisiana and the media for the slow response to Katrina. The public later learned that Brown had no qualifications for his position. Brown currently hosts a radio talk show on NewsRadio 850 KOA in Denver, Colorado. 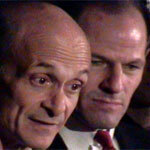 Chertoff co-founded the Chertoff Group, a risk management and security consulting company, which employs several senior officials from his time as Secretary of Homeland Security as well as Michael Hayden, a former Director of the National Security Agency and the Central Intelligence Agency. 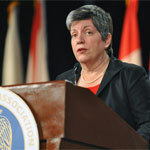 The third and current Secretary is Janet Napolitano, former Arizona governor. 2006 — President Bush signed the Security and Accountability for Every (SAFE) Port Act into law in October along with the Secure Fence Act and legislation related to chemical plant security and Federal Emergency Management Agency (FEMA) reform. The port security provisions comprised one of 20 bills introduced to Congress in the wake of the Dubai Ports World controversy that aimed to block Dubai Ports World acquiring P&O Ports, and more generally to stop key US ports falling into the hands of foreign owners. The Unlawful Internet Gambling Enforcement Act of 2006 (UIGEA) was tucked into the SAFE bill and caused controversy. 2008 — The first passenger flight was equipped with laser missile-dazzler defenses for trial runs, reported in July. While considered a major milestone at the time, nothing has been printed about the JetEye since. The threat that JetEye was intended to guard against is from shoulder-fired homing anti-aircraft missiles, which were only a threat to an airliner during landing and takeoff. 2010 — Department of Homeland Security (DHS) Secretary Janet Napolitano announced in June that 100 percent of passengers traveling within the United States and its territories were checked against terrorist watchlists through the Transportation Security Administration’s (TSA) Secure Flight program. This was a major step in fulfilling a key 9/11 Commission recommendation. 2011 — The Naval Postgraduate School Center for Homeland Defense and Security’s University and Agency Partnership Initiative (UAPI) reached a milestone in late January as the number of education partners topped 1,000. The nation’s leading program for establishing and sharing homeland security curricula was established in 2006, and its mission is to facilitate educational collaboration among institutions and agencies across the nation to support development of homeland security academic programs. That same year, the Center for Homeland Defense and Security (CHDS) technical staff also developed a separate, stand-alone UAPI website to enable greater direct access to educational materials and encourage more participation in academic practitioner discussion forums. Moreover, the site simplified how users can obtain course material by organizing it into video, lectures, slide presentations, syllabi, and other offerings. 2011 — U.S. Customs and Border Protection (CBP) announced in May that the agency’s Trusted Traveler Programs have reached one million members. Trusted Traveler Programs include Global Entry, NEXUS, SENTRI, and FAST. All Trusted Traveler Program applicants must voluntarily undergo a background check against criminal, law enforcement, customs, immigration, and terrorist indices; a 10-fingerprint law enforcement check and a personal interview with a CBP officer.